If I had to make a list of some things that complete my life, coconut bacon might be one of them. When I first came to the states a decade ago, I was addicted to Morningstar’s vegetarian bacon. It was wonderful. There was really no such thing as substitute anything for vegetarians in Japan back then, so I devoured every substitute anything I could get my hands on. Plant based “bacon” or facon was on top of my list next to Tofutti cream cheese. So after I went through my transitioning phase, or Faux Faze as my husband likes to call it, I came to terms with the fact that as amazing as these substitute things were, they were in fact heavily processed, not very good for you and I needed to move on. I thought I wouldn’t be able to enjoy my facon again, until I came across something called coconut bacon in recent years. I think I actually heard angels singing the first time I had it! Not processed and made from coconut flakes. It was almost too good to be true. I immediately had to start tinkering with my own version. Making raw vegan coconut bacon is quite simple. The key ingredient is the liquid smoke. This stuff makes this recipe, in my opinion. I like using the Wright’s liquid smoke in hickory flavor. I’ll attach the link below. I also use the mesquite flavor from Wright’s as well. Now technically, liquid smoke is not processed at 118° or below, so not officially “raw.” But it falls under the same category as nutritional yeast as an acceptable divergence in the name of flavor. You can use whatever smoke flavor you like, but try to find the one with few ingredients. I like Wright’s because it’s just water and natural smoke flavor. Each kind of liquid smoke is different in intensity of the flavor so you would need to adjust the amount you use to taste. For instance, when I use the mesquite instead of the hickory, I need to up the tamari, maple syrup, and mesquite liquid smoke amounts. Somehow, using hickory smoke makes it intense in flavor with lesser amounts of seasoning than the mesquite. Assembly is very simple. Put all ingredients into a bowl and gently stir without breaking the coconut chips into small pieces. I find it helps to let it sit for a minute or two, after you stir it a couple of times. 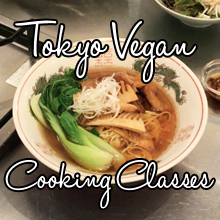 It lets the coconut chips soak the seasoning up, and soften so it’s easier to mix together. Taste it and make any needed adjustments. Line the dehydrator tray with a teflex sheet and lay out the coconut bacon thinly and evenly. Dehydrate at 115℉ (46℃) for 6-8 hours until completely dry and crisp. And now just to give you a few more options, you can use an oven if you don’t have a dehydrator, but it won’t be raw. Preheat the oven to 300°. Lay out the coconut bacon on a baking sheet in a nice thin layer. Bake for 20-30 minutes, while stirring every 5 minutes to prevent burning. Once the color of the coconut flakes turn golden brown like the picture below on the right, it’s done. The coconut flakes will be still soft and you may even see a little bit of moisture at the bottom of the pan, but don’t worry. As it cools off, it will harden and dry out. If you bake until the coconut flakes harden and dry out in the oven, sometime it will end up burning them so so it is very important to go by the color. You can also bake it in the lowest temperature setting your oven allows. Once again, lay out the coconut bacon on a baking sheet in a nice thin layer. Bake for about 10 hours until dry and crisp, stirring occasionally. My lowest temperature setting on my oven is 140°, and it took 10 hours. There you have it. Pretty straight forward. Now you can top it on salads, use it on vegan BLTs, anything and everything bacon would be good on. I like to put it in my raw vegan mac & cheese, and now working on a raw vegan carbonara recipe. 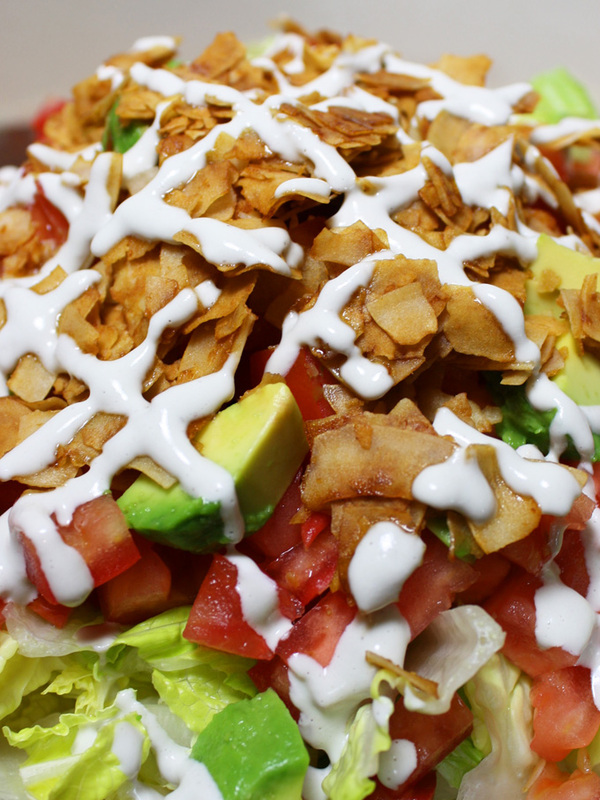 I will do a raw vegan mayonnaise recipe next week, and a BLT salad after that. Stay tuned! Ahhh, coconut bacon, you complete me. 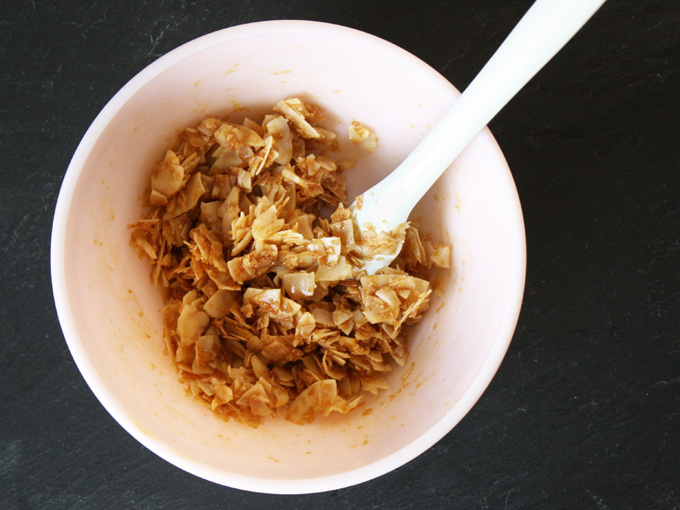 Put all ingredients into a bowl and gently stir without breaking the coconut chips into small pieces. I find it helps to let it sit for a minute or two, after you stir it a couple of times. Adjust the amount of tamari, maple syrup, and liquid smoke to taste. Line the dehydrator tray with a teflex sheet and lay out the coconut bacon thinly and evenly. Dehydrate at 115℉ (46℃) for 6-8 hours until completely dry and crisp. Preheat the oven to 300°. Lay out the coconut bacon on a baking sheet in a nice thin layer. Bake for 20-30 minutes, while stirring every 5 minutes to prevent burning. Preheat the oven at the lowest temperature setting. 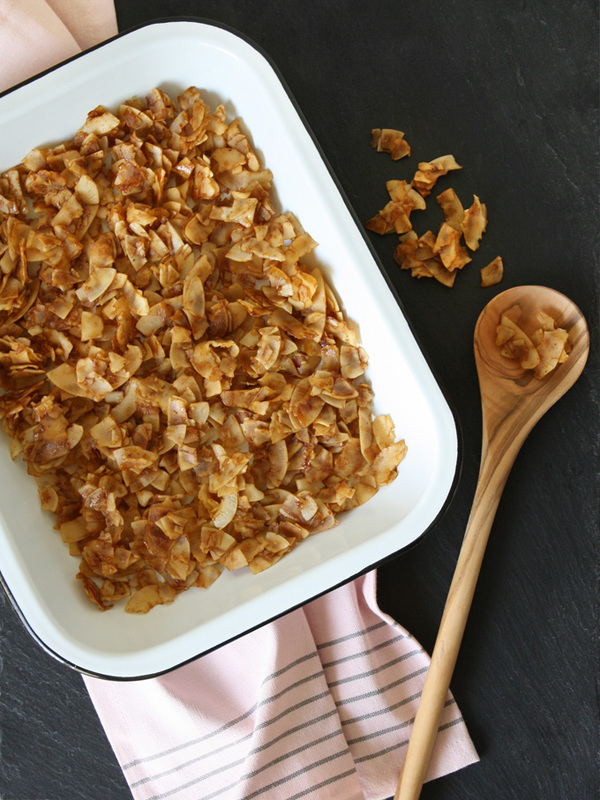 Lay out the coconut bacon on a baking sheet in a nice thin layer. Bake for about 10 hours until dry and crisp, stirring occasionally. Each kind of liquid smoke is different in intensity of flavor, so you will need to adjust the amount you use to your liking. The smaller amount of seasoning in this recipe is the amount I use for the hickory smoke and the larger amount of seasoning is for the mesquite smoke. Store in an air-tight container. Keeps for 2 weeks.